The new Russian pipeline projects – Nord Stream 2 and Turkish Stream – are designed to kill Ukrainian gas transit. However, there also is a collateral damage – the diversion of gas flows would significantly reduce transit volumes and hurt operators’ revenues in Slovakia, Romania, Bulgaria and Austria. Keeping Ukrainian transit alive is beneficial for all parties, except contractors of Gazprom. Revenue of Slovak Eustream is already affected by higher utilization of the OPAL pipeline capacity recently permitted by the European Commission. In early January 2017, Gazprom and European operators reported record daily volumes of Russian gas delivered by Nord Stream. The flow reached 168 million cubic meters per day (mmcmd, at +20°C) compared with the average of 126 mmcmd of the first half of December. Cold weather forced Europeans to buy more Russian gas. Without having access to the additional capacity of OPAL, Gazprom would have bought more capacity in Slovakia, above the current contracted level of 179 mmcmd (now Velke Kapusany receves up to 157 mmcmd). It looks like the European Commission has violated its own criterion saying that “the exemption does not harm the functioning of the EU’s internal gas market or the transmission system to which the infrastructure is linked”. Nord Stream 2 is designed to further reduce the transit volume of Russian gas through Slovak pipelines. Gazprom has booked Slovak transit capacity on the ship-or-pay condition to 2029. However, Eustream would definitely become less efficient which contradicts the European rules (“the exemption must not be detrimental to competition or the effective functioning of the internal market in natural gas, or the efficient functioning of the regulated system to which the infrastructure is connected”). In my view, Slovakia has a strong hand in the political game against the EUGAL pipeline that is supposed to receive gas from Nord Stream 2. Without EUGAL, Nord Stream 2 would be a pipeline to nowhere. A similar situation is developing on the southern front. In 2016, the Romanian section of Trans-Balkan Gas Pipeline (TBGP) shipped 17.0 bcm of Russian gas, including 11.7 bcm for Turkey and 5.3 bcm for Bulgaria, Greece and Macedonia. In case of completion of one line of Turkish Stream, Romania would inevitably lose the transit flow to Turkey but I am sure Romanian Transgaz would fight for keeping the remaining transit to the Balkan countries. Gazprom plans to reverse the TBGP flow leaving Romania without any transit revenue. Bulgaria shipped 14.6 bcm, including the mentioned 11.7 bcm to Turkey and 2.9 bcm to Greece and Macedonia. With the Turkish flow diverted to the new pipeline across the Black Sea, Bulgartransgaz would have to choose between keeping the remaining transit volumes of about 3 bcm a year and shipping a half of that to Romania by the reverse scheme. The underwater pipeline to Turkey is aimed to replace the current route from Russia to Italy via Ukraine, Slovakia and Austria. Brussels should keep in mind that extending Turkish Stream to Southern Italy, would affect the revenues of Eustream and Gas Connect Austria. Playing the Kremlin’s game of killing the Ukrainian transit also means dumping gas transit business in Eastern and Central Europe. I believe the affected operators would do their best to prevent the European Commission from giving permissions to EUGAL and for Russian gas to cross the Turkish-Greek border. Keeping Ukrainian transit is beneficial for both the EU importers and the Russian exporter Gazprom. Nord Stream is supposed to work at full available capacity irrespectively of seasonal or short term demand fluctuations. Nord Stream (and the St.Petersburg region) is fed through the Ukhta-Gryazovets and Gryazovets-Vyborg pipelines. This system is fully loaded in winter time and there is not enough storage capacity in the area. Unlike Nord Stream, Ukrainian transmission system can supply gas in accordance with the importers’ demand. Russian pipelines running from West Siberia to Ukrainian border, as well as Ukrainian transit lines, have significant spare capacity – gas flow across the border of Slovakia can be raised from the current 150 to 200 mmcmd. Huge gas storage facilities in Western Ukraine provide additional security of supply. Understanding the problem, Gazprom suggested to shave the peak demand by supplies of LNG from its projected plant at the Baltic Sea. I am afraid this plan would not work. LNG delivered to a terminal in Northwestern Europe cannot be of any help to short-term or seasonal surge of demand in Baumgarten, Austria. Gazprom anticipates growing role of gas as a backup fuel for renewable energy. Base load gas of Nord Stream does not fit this agenda. Without Ukrainian transit, Gazprom will not be able to meet peak demand of gas in Eastern and Central Europe. Nord Stream experience shows that transit-free pipeline does not guarantee stability of supplies of Russian gas. In January-March 2015 Gazprom cut 50 per cent of daily exports trying to undermine the reverse gas supplies from the EU to Ukraine. It was not a surprise because President Putin warned the EU well in advance. It was important for Mr. Putin to show the reliability of Nord Stream but apparently the desire “to punish” Europe was irresistible. There is no doubt Mr. Putin would do it again if Germany and the EU get a way more dependent on expanded Nord Stream. Finally, there is a growing risk of terrorist attack on gas pipelines. 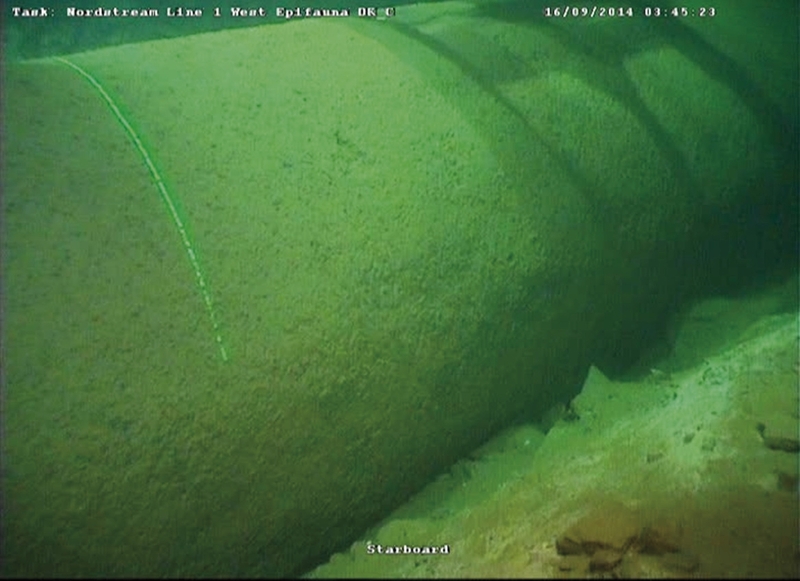 A remotely operated underwater vehicle can place an explosive device on Nord Stream pipelines that are laying on the sea floor. It is worth noting that a blown up section of land pipeline can be replaced in a matter of days. Replacing a section of Nord Stream would take several months. The Yamal-Europe pipeline is working at full capacity now. If the flow goes down with the end of the cold wave, Poland will become a natural leader of the anti-Nord-Stream-2 team. This entry was posted in Europe, The Region and tagged gas, Gazprom, Greece, Eastern Europe, natural gas, Nord Stream 2 , Trans-Balkan pipeline, Ukraine, Putin, Turkey by Mikhail Korchemkin.